7 Must-Try Water Slides Around the World! It’s that time of year when the sun is (sporadically) appearing and we’re all dreaming of being abroad, and what’s better than splashing and sliding down an epic water slide in the scorching sun! From vertical drops to loop the loops, we’ve picked out some of the craziest water slides from around the world for all you adrenaline junkies out there. If you’re a lover of big slides then why not try the world’s tallest, which reaches a whopping 168 foot – higher than the famous Niagara Falls. If you dare take a ride on the slide, you’ll be strapped into a three person raft which shoots you down at an insane 65mph. Get ready to hold on for your life! If you want the thrills of a rollercoaster with water splashing and curving walls, this slide is for you. America’s first slide with an almost vertical loop drops you down from a trapped door when the floor disappears without any warning. The rider will power through the tunnel at more than 50 feet per second, so be ready to get soaked and very scared! Everything you need to know about this water slide is in the name – it’s insane! It’s towering, it’s scary and it only takes a few seconds to complete. The slide was once listed in the Guinness Book of World Records as the tallest water slide, and for those who love a good view can admire the Atlantic Ocean from the top while waiting to slide down from 14 stories high! This unique, Indiana Jones style slide sends you down the iconic Mayan Temple into a clear tunnel surrounded by a shark filled pool! But don’t worry; you’ll be going so fast you barely notice them. Placed in one of the world’s largest water parks, this slide is definitely worth a visit if you think you have the courage to step up to the start! If you don’t want to ride alone, this multi-person tube allows you and your friends to slide down a 53 foot vertical drop into a giant funnel together. Flashing lights and loud music will surround you on this one of a kind slide, while whizzing up and around the tunnel. If you’re the type of person who loves spinning around and never gets dizzy then you’ve got to give the Twister and Speedy a go. 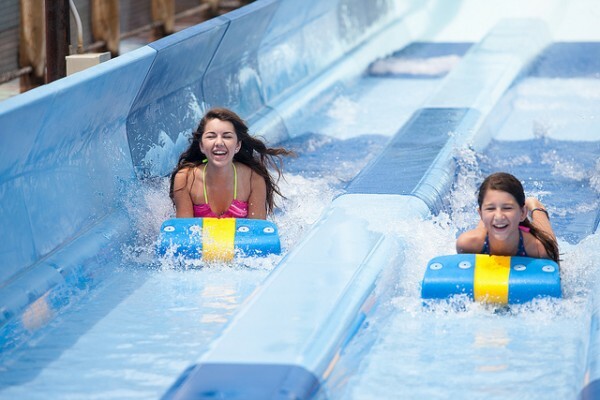 With endless turns and twists you won’t be able to walk in a straight line after taking a splash on one of these slides! While Twister is not necessarily as fast as some, it’s one of the longest indoor slides in Europe, whereas Speedy alternatively catches far more speed. Sci-fi fanatic or not, this unique invention will still amaze you. A retired Boeing 747 converted into four water slides has been placed in an impressive science based water park, right next to the Evergreen Aviation and Space Museum. Although these slides don’t have the ultimate fear factor for adrenaline seekers, there’s nothing quite like this creation in the world – And the kids love it too! Will you be adding these to your travel to-do list? Or have you already checked one off? Let us know over on Twitter!